Big schools of scissortail damselfish at Islote. Dive Journal: This morning we head south to the Cabo Pulmo Marine Reserve, and we anchor on the west side of Islote, a large protruding rock formation just off the coastline. This is a return dive for me, but I have not been here for a long time (not since 1997 – dive #8). We descend into abundant sea life coupled with beautiful lighting. There is something about the way the light enters the waters around Islote that makes this dive really special. The fish in the marine reserve are friendly and allow close approaches. There are wonderful schools of king and cortez angelfish. We come across several large panamic green morays, one of them even free-swimming. There are two large sting rays on the floor around the rock base, and Linda finds a handsome bulls-eye skate as well. 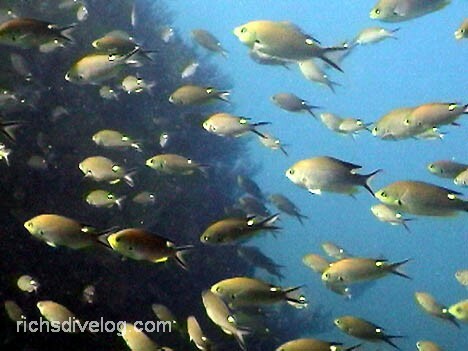 Schools of scissortail damselfish cascade down through us – there are so many fish here! We find moorish idols, barberfish, bumphead parrotfish, and more coral hawkfishes. We also get an excellent video shot of another giant hawkfish on the west face of the rock around 35 feet down. As we slowly ascend toward the boat, we continue our tour and enjoy the near-vertical rock walls and soft corals in the top 30 feet of water. A big school of gofftopsail pompano entertains us at the dive’s end. Great dive!